Saving the Planet One Child at a Time: Children, School Strikes and Global Climate Action - Integration Through Media ....! They subsequently starved, suffered deprivation, were killed and enslaved on route to their destination. The modern student movement against climate change stresses another Jerusalem, that there will be nothing to salvage if nothing is done now. We are all, in short, for the chop if climate change is not arrested. As an Oakland high-schooler by the name of Bruke told Wired, “My GPA isn’t going to matter if I’m dead.” And much else besides. To such movements can also be added other acts of striking in peaceful protest. Tens of thousands of US students did so in 2018 swathed in the grief and despair of gun shootings, the most immediate being the Marjory Stoneman Douglas High School shooting. The National School Walkout of March 14 and the March for Our Lives ten days later had a biting clarity of purpose: students and staff were entitled to feel secure in the teaching and learning environment. The movement was characterised by much eloquence wreathed in anger and tears, not least of all Emma Gonzalez, who chided those political representatives “who sit in their gilded House and Senate seats funded by the NRA telling us nothing could have been ever done to prevent this”. Protests were registered on March 15 across 2,052 venues in 123 countries. There were 50 in Australia; and protests in every state in the United States. Often forgotten in these movements is the role played by children themselves in the organisational side of things, often clear, fathomable and inherently coherent. In the United States were such figures as 12-year-old Haven Coleman of Denver, Colorado, Alexandria Villasenor of New York City, and 16-year-old Israr Hirsi of Minnesota. Squirrel scholars suggest that these actions represented a “transformation” at play. Associate lecturer Blanche Verlie claimed that her research revealed how “young people’s sense of self, identity, and existence is being fundamentally altered by climate change.” It can be tempting to read too much into matters, to see flowers grow in fields initially thought barren. 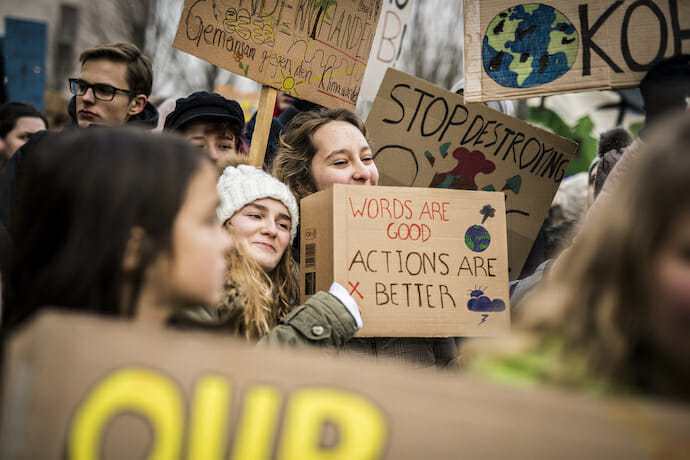 But there is little doubting climate change as a catalyst of active and noisy encouragement amongst youth, one akin to the anti-war movements of the Vietnam War period. In Australia, New South Wales Education Minister Rob Stokes preferred to brandish the rod of punitive action: both students and teachers would be punished for participating in the March 15 rally. By all means, find your “voice”, suggested the threatening minister, but avoid doing so during school hours. For such scolding types, climate change and injustice have strict timetables and schedules, to be dealt with in good, extra-curricular time. Australian Resources Minister Matt Canavan’s views on the youth climate action movement are childishly simple and representative, suggesting that Thunberg is correct in her harsh assessment. Recorded in November last year, the minister sees education as an instrumental affair. “The best thing you’ll learn about going to a protest is how to join the dole queue. Because that’s what your future life will look like […] not actually taking charge of your life and getting a real job.” Forget the environment’s durability; drill it, excavate it, mine it, drain it and burn it to a cinder. Australia, and the world, do not need environmentally conscious citizens, merely automata consuming and feeding the commodity markets. For the likes of Canavan, it is too late. For the children, the battle to change the beastly status quo is urgent, pressing and inevitable.